It's pretty incredible how cheap microSD cards have become over the past few years. Just a few years ago, I had to pay upwards of $100 for a 128GB card to put in my Surface Pro (so I could install more Steam games). 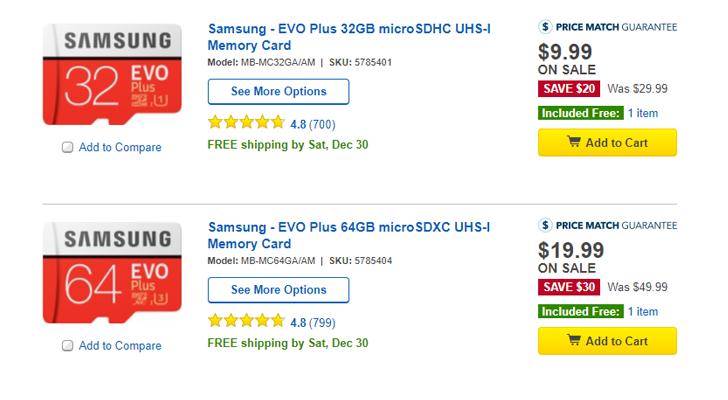 Now you can get a 32GB and 64GB card for $9.99 or $19.99 respectively from Best Buy. The 32GB card is only UHS-1, so you can expect a minimum sequential write speed of 10MB/sec. That means it's not ideal for use with an Android device (unless you just want to store music files or something), but it will work fine for cameras and other basic electronics. The 64GB card is UHS-3, so you'll get a much faster 30MB/sec minimum seq. write speed. You can buy both cards from the source link below. If you're confused by all the microSD card ratings, check out our buyer's guide.